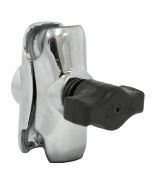 The Chrome RAM-B-309-2CHU connects to your handlebar clutch/brake clamp, left or right side, and holds two 1" diameter mounting ball. The ball that is connected between the hole centers is removable. 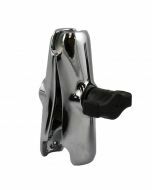 The base fits the control clamps on your motorcycle with 40mm x 6mm stainless steel hardware, provided in the kit. To see if the RAM-B-309-2CHU base will mount to your motorcycle, check the hole spacing of the base against your clutch/brake reservoir. The holes centers have a minimum width of 0.94" and a maximum of 1.58".